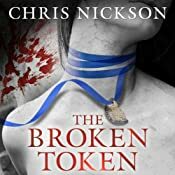 Steven Pacey has narrated the first in Chris Nickson’s historical murder mystery series set in Leeds in the 18th Century: The Broken Token. Facebook Page for the series. Chris has also published 28 other non-fiction books, most of them quickie biographies, and has had a pair of one act plays staged in Seattle. His short fiction has appeared in several small magazines, and most recently in the anthology Criminal Tendencies. He moved back to the UK in 2005. The Broken Token was published by Creme de la Crime in 2010. The second of the Leeds novels featuring Richard Nottingham appears in hardback in May 2011 (September in the US), with the third and fourth (The Constant Lovers and Come the Fear) appearing in 2012. The fifth in the series, will be published in the UK in February 2013. The audiobook of The Broken Token is out, and will be joined in March 2013 by Emerald City, a simultaneous audiobook and ebook release. Today sees the release of my first audiobook, The Broken Token, done through the excellent people at Creative Content and spoken by the veteran actor Steven Pacey, who’s done similar work for authors like Susan Hill and Joanne Harris, both of whom are in my pantheon of greats, so I feel in esteemed company. I received my copy last week, eight CDs of it. I’ll admit, I was full of trepidation when I put it in the CD player. At appearances I’ve read sections from the book numerous times. I know the language, the flow, the Leeds feel of it all. Above all, in my head I had the voices of the characters. What I heard wasn’t those same voices; of course, it couldn’t be. As a wise woman told me, it’s an interpretation. But it’s an excellent one. His Amos Worthy seethes with menace, every bit as good as I could have hoped. Listening to it I’ve learned a great deal, most particularly that a book from someone else’s point of view will be different, but it can be just as good, if not even better, as those people come at it objectively. So I’ve moved from trepidation to outright joy. More than that, to gratitude to the team and to Steven for putting so much into it, and finding things I’d never imagined. Go on, have a listen to an excerpt. You can do it here. I’ll guarantee that you won’t be disappointed. The audiobook has been released into the wild. May it soar high. Pickpockets, pimps, and prostitutes: All in a day’s work for the city constable – until work moves too close to home…. When Richard Nottingham, Constable of Leeds, discovers his former housemaid murdered in a particularly sickening manner, his professional and personal lives move perilously close. Circumstances seem to conspire against him, and more murders follow. Soon the city fathers cast doubt on his capability, and he is forced to seek help from an unsavoury source. Not only does the murder investigation keep running into brick walls, and family problems offer an unwelcome distraction; he can’t even track down a thief who has been a thorn in his side for months. When answers start to emerge, Nottingham gets more than he bargains for….